Friday, April 27th at 2PM in Liberty Square, the Final Spring Training is here! It's been 6 weeks of training in street tactics. We've learned how to creatively move and communicate together as a unit, and disperse and swarm to reach a target. Along the way, we've built a community of trust by practicing together. And we've rung the People's Gong, a call to action, six consecutive weeks in a row. 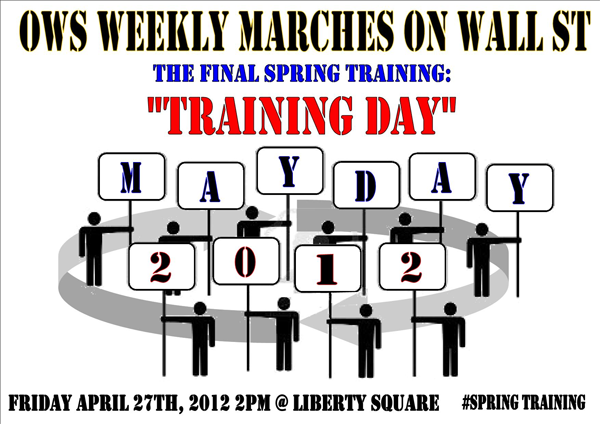 Join us for the final Spring Training: Training Day. We will do a dry-run of May Day's Pop-up Occupation activities in Liberty Square - forming picket teams to target corporations and banks in the Wall Street area. Pacer teams will conduct training on how to do picket lines while in front of targets. We'll do a final convergence before heading over to ring the People's Gong. On May 1st its time we make history! Captain America is back in action this Friday! I will like to thank my second family OWS for supporting me and my family in these difficult times. My dad told me before he passed away is to stay strong. Never give up! Stand up for what you believe in. The whole "Training" and "Hiding in Plain Sight" thingis really stupid. All you're gonna do is not go to work or school, you are really showing em by doing that.